She is a wife and mother and knows how to appeal to a wide audience including children with well-balanced delicious and easy to fix meals. The book is organized by meal category, making it easy to use and includes in introduction by Dr. Oz himself on the benefits of healthy eating and by Lisa Oz on how to prepare one’s pantry (how to stock), counter (what to keep out on the counter instead of refrigerating it), refrigerator, and freezer. These lists are comprehensive and well presented. In fact, they make a good reference for whenever you might have a question about basic food storage. Dr Oz’s introduction is much longer than I thought it would be. He offers open honest insight into his own family life and way of eating. If you are a fan, you will find this quite interesting, informative and exciting to learn so much detail about a TV hero. Even if you are not a fan, the information on basic food habits of a very busy family will give you insights into how to structure a good food eating program for your own brood. Lisa Oz is no slouch. She is a writer, producer and entrepreneur, edits the Dr. Oz magazine and helped found a group called the Health Corps, which is a peer-mentoring nonprofit. The aim of that group is to deliver a progressive curriculum in nutrition, fitness and mental resilience to teens in at rick communities across the country. 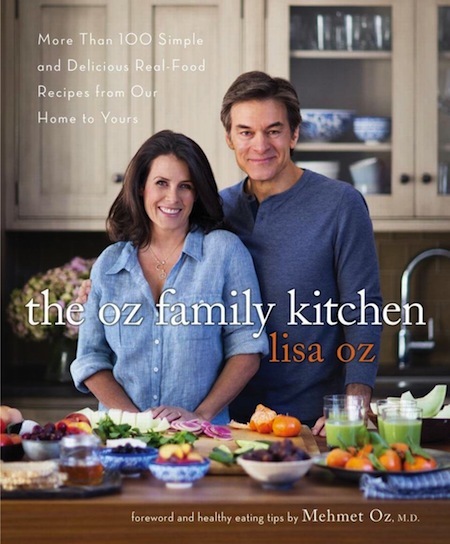 One of the very first recipes in the book, a part of the introduction, is one of the dishes Lisa Oz tasted in Turkey when she met Dr. Oz’s family after their engagement. It is a homey, delicious and adapted for American kitchens version of a super delicious eggplant dish called “The Priest Fainted.” When I saw her take on that recipe, which I have enjoyed in Turkey, I knew I would like this book. Some of my other favorites, include her Mediterranean grilled eggplant wraps and a variety of vegetable delights like white bean and spinach soup and warm quinoa wand chickpeas. She also adds chickpeas into a very inventive fried rice paella with spiced chickpeas and shrimp. Dishes like the Oz family roasted turkey with apricot and rosemary stuffing, rack of lamb with hazelnut and herb crust—and lentil and mushroom loaf offer a wide range of main course dishes.Cakes and cookies are not ignored—even a healthy eating diet allows special occasion sweets and Lisa Oz provides us with her family’s favorites. I like this book—it offers a wide range of tasty options that should appeal to many tastes. Its excellent information on pantry and preparation make it a great gift for the new cook and the wide variety of recipes, make it an interesting choice for cooks of all interests and abilities.